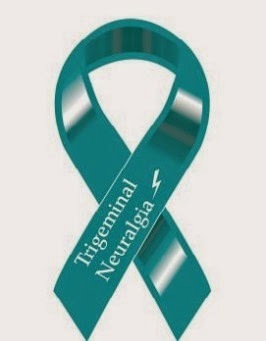 Trigeminal Neuralgia (TN) is often considered the most painful disorder known to mankind. TN (a.k.a. tic douloureux) is a disorder of the fifth cranial (trigeminal) nerve that causes episodes of intense, stabbing, electric shock-like pain in the areas of the face where the branches of the nerve are distributed, such as the lips, eyes, nose, scalp, forehead, upper jaw, and lower jaw. This blog chronicles my journey. Photo Gallery - Light Up Teal!! I am so tired. I am exhausted actually. Trigeminal Neuralgia pain wakes me almost every night. The pain is so intense that I am afraid to move a muscle. Last night, I was awake until 3am, couldn't even think about sleep although I was wrecked. My face was on fire, it was swollen and when I looked into the mirror I got a fright. I looked awful, I have uneven pupils, one side of my face was swollen and I was trying my best not to cry. Crying makes the pain a lot worse. 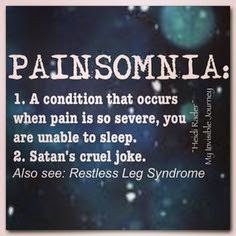 I eventually fell asleep, only to wake up at 5.30am with pain radiating down the left side of my body. It wasn't just my face, it was everywhere. I tried to stay calm and it took about twenty minutes for this to ease a little. I got out of bed and walked around my room for a while, just pacing trying to distract myself. I was told my a migraine nurse to refrain from taking painkillers as she thinks there is a migraine element to my pain, but I put my back out two weeks ago and it's still painful. I swallowed a couple and went downstairs. She doesn't have to cope with chronic pain, and it's so easy to give orders like this when sitting down and writing my life story down in bullet points. Everything seems so much worse at night, it's the silence I think. During the day there are so many distractions. Whether it's writing tonnes of emails, cleaning the house or talking to my sisters and friends, life seems that bit more bearable. Night time is complete and utter hell. I was always a night owl, even as a child, but waking up in so much pain is soul destroying. I know that there are support groups that I can reach out to at night, but it never came into my head. This is not the first time this has happened, and I know it's stupid not to call someone, but realistically what can anyone else do? I would just be worrying them unnecessarily. As I am writing this, the pain is sharp and burning. Medications I am taking are not doing their job, and it is really difficult to beat back the anger. I told a friend of mine who worked as a field doctor with the government that I had Trigeminal Neuralgia. First thing he said that it was related to migraines. Sounds your nurse and him are on the same page. I am so tired of the word headaches. It is so insulting. I wish some of these idiots had to experience the pain we feel for 1 DAY. I lost the plot when I was told in hospital that they had "headaches" on my chart, despite my TN diagnosis in the same file. The Information given on causes and cure of migraine is quite awesome. Do visit web health network for more information on Migraine it's causes and cure. Visit Sarah H's profile on Pinterest. Day By Day, Hour By Hour. We Need A Cure -- Seriously.